Magyarosaurus was a plant-eater (herbivore) that lived in the area that is today Romania during the late Cretaceous period, between about 71 and 65 million years ago. 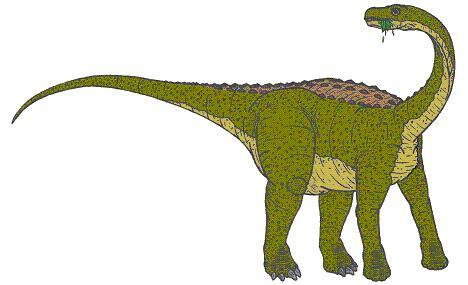 Magyarosaurus was quite small for a titanosaur, only about 20 feet (6 meters) long. When the animal was first discovered, it was named by Baron Nopsca in 1915 by Baron Nopsca as "Titanosaurus dacus" (Dacia being a reference to ancient Romania), subsequently, however, (in 1932 by Friedrich von Huene), its name was changed to "Magyarosaurus dacus" to reflect the fact that both ethnically Hungarian and Romanian people live in the area in which the animal was found (Magyar is a reference to the Hungarian people). European Dinosaurs - Magyarosaurus lived in Romania. Magyarosaurus was a genus of dinosaur. "Magyarosaurus" means "Magyar lizard" (Magyar is a reference to the Hungarian people). It was originally named (in 1915 by Baron Nopsca) as "Titanosaurus dacus" (Dacia is a reference to ancient Romania), but its name was changed in 1932 (by Friedrich von Huene) to "Magyarosaurus dacus" (to reflect the fact that both ethnically Hungarian and Romanian people live in the area in which the animal was found). Magyarosaurus was a member of the Saurischia ("lizard-hipped") order of dinosaurs. What this means, is that although Magyarosaurus was not closely related to lizards, it did have similarly shaped pelvic bones. Magyarosaurus was a Sauropod - a member of a group of related large quadrupedal herbivorous (plant-eating) dinosaur with long necks. Magyarosaurus lived between about 71 million years ago and 65 million years ago, during the late Cretaceous period. Magyarosaurus was one of the dinosaurs which died out during the Cretaceous-Tertiary mass extinction at the end of the Mesozoic Era. Magyarosaurus was a herbivore (plant-eater). Magyarosaurus was about 20 feet (6 meters) long. Magyarosaurus weighed about 1 ton.